About nine months ago, the United States Agency for International Development released its first-ever Strategic Plan for Water and Development. In my last post, I talked about a need for a dialogue on water issues, and within the development world, this document was a milestone. Beyond balancing water demand to ensure food security, sound water and sanitation policies will be crucial to meeting public health and national security priorities. Water is playing a larger role in energy, conflict, climate change, biodiversity, ecosystems, and economic growth. These objectives are at the heart of this plan to revitalize the way we approach these issues in the international development community. The figures are telling. While significant strides have been made in both water and sanitation-related issues, many parts of the world still lag far behind international standards. Sub-Saharan Africa in particular is a nexus of both failing infrastructure and massive population growth projections. According to a 2013 WHO/UNICEF water progress report, 768 million people still rely on unimproved drinking-water sources as of 2011. Sub-Saharan Africa continues to pose the greatest challenges for improved water access issues. Despite massive efforts, we will miss the 2015 MDG target for sanitation by nearly half a billion people. Improving global public health outcomes by utilizing sustainable water management, sanitation, and hygiene strategies. Managing water for agriculture sustainably to increase productivity and food security. Transformative Impact – Countries in transition which can radically alter policy to leverage development resources. Have base infrastructure and the social environment for big changes. Leveraged Impact – Countries which lack basic infrastructure and offer the potential for big gains with small investments. Small targeted grants will be key here. Strategic Impact – Countries which have been identified by the intelligence community to be of national interest. Water and regional security are intimately intertwined here. Overall, I think this represents a major push toward the leadership we need on water, sanitation and hygiene (“WASH”) issues. From an increased focus on sanitation to some of the language on climate change and local ownership, to a very real effort to include monitoring and evaluation on projects, the document acknowledges the complexity of the issues in this sector. It is, however, only a first step. Anyone working in development will tell you that strategic plans often play out differently in the field than on paper, and some of the finer details will probably be lost in actual implementation. Additionally, as other bloggers have noted, the target numbers are lower than they probably could be, which will be disappointing for those countries who just barely miss the cutoffs for prioritization. Nevertheless, I think it is a well thought out document and a great first step. At just under a year into the initiative, there are many exciting projects on the line. It will be interesting to hear how they all turn out in the years to come! For people who say America can’t afford to invest in clean water for the world, I would point out that experts in the Pentagon and elsewhere have called the world water shortage a real and growing threat to America’s own security. In fact, you only had to read New York Times columnist Tom Friedman’s devastating piece this weekend about how drought and water mismanagement contributed to Syria’s bloody civil war to understand this serious point…The way to douse the flames of global poverty and disease and conflict is not more fire, it is clean water. Beyond this strategy being fantastic for humanitarian and economic reasons, we can not forget that water issues will continue to underpin American national security interests for decades to come. The lessons in Thomas Friedman’s piece are just as relevant today as they were when they were written. So the next time someone tells you that development work isn’t in America’s national interest, just point them this way! Helping organize a conference on conservation agriculture in Cambodia was quite the novel experience for me. I was excited, nervous, and a bit frazzled. In the end, I thought that the conference itself was very successful. With the aid of a photo montage, I shall share with you my observations of some interesting aspects of the Cambodian culture and also give you a look at what went on at the 4th International Conference on Conservation Agriculture in Southeast Asia. When I travel to new places, I like to visit a local market so that I can ogle the fresh fruits and vegetables and learn more about the local foodways. My first day in Cambodia, prior to a mid-morning trip from Siem Reap to Battambang, I woke up early and took a tuk tuk with Tom to Siem Reap’s downtown market. The market was bursting with locals who were doing their weekend grocery shopping. There were a number of items my colleague Tom and I had never seen before, and vendors were more than happy to help us by trying to give these mysterious edibles English names. Tom decided he needed a haircut so he could look his best for the conference, but all of the women barbers at the market claimed they did not know how to trim a man’s hair. We were, however, in luck. The sole male barber was able to give Tom a stylish do. The conference began at the University of Battambang (UBB) with introductory remarks from speakers that included the new president of UBB, Dr. Sieng Emtotim, and Dr. Waded Cruzado, president of Montana State University and member of USAID’s Board for International Food Agriculture and Development. During the conference, there were a range of presentations related to conservation agriculture—including my own, titled “The Paradigm of Sustainable Intensification: A Multi-faceted Systematic Approach.” My favorite workshop was one Tom led on agriculture, education and technology in Cambodia. The room split up into groups which were tasked with coming up with responses to questions about obstacles and strategies for building human and institutional capacity in conservation agriculture in Cambodia. The enthusiasm from the participants was infectious. Every group wanted to present their ideas first, with the UBB student team particularly eager to show off their prowess. We brought a group of farmers from both Battambang and Siem Reap to speak at the conference and answer questions. Women farmers in Siem Reap grow vegetables and are part of a collective group. The project helped these farmers install drip irrigation in their plots. They have also set up on-farm trials. The conference included trips to the farmer field sites in Siem Reap and also the SANREM trial sites in Battambang. Almost 200 people participated in these field trips. At the field sites in Battambang, our SANREM Cambodia country director, Rada Kong, talked about our field trials and the extension services we provide to the community. A no-till seeder demonstration garnered much interest. After the machine did its thing, everyone was on the ground digging away to find the no-tilled seeds the machine had planted. Rada Kong also showed how minimally tilled soil holds its structure for a longer time in water than conventionally tilled soil. In Siem Reap, the women farmers, with the help of an NGO member that SANREM works with, explained what they were doing with SANREM and what they want to do using pictures they drew themselves. On the final night of the conference, UBB hosted a large dinner party for us. They set up tables, chairs, and a large stage by the river. UBB had some really great surprises in store for us that night, including a live band and performances from the student dance club. You could tell these students loved to dance. The UBB president told me that they travel to nearby countries to perform traditional Cambodian dances in competitions. Near the end of the night, everyone was ushered onto the dance floor to dance Cambodian style in a large circle with the men on one side and the women on the other. As the laughing and dancing went on, more and more people joined in, and the two genders mingled with one another. Since I was a conference organizer (and I am sure they heard me talk one too many times on the microphone), everyone wanted their picture with me. It was almost like I was a movie star for the night. The trip ended with a visit to the temples of Angkor Wat. My bus’ tour guide, Peaches, regaled us with stories about the history of the Cambodian people and traditional religious tales and myths which were illustrated on the temple walls. The carvings on the walls were really amazing, and I particularly liked how many of them depicted the activities of everyday life thousands of years ago, giving us more of an idea of what it was like to live back then. I even spotted two people playing an ancient form of chess. Communicators at Virginia Tech always encounter turbulence in stories describing “unmanned autonomous systems,” commonly referred to as drones. That’s not a bad idea. But I’m not certain if it is accurate to say that if the aircraft is controlled remotely at any point during a flight. And the problem is, if you don’t use the word “unmanned,” you risk not speaking the language used by industry and government. You are overlooked in their searches. Type in “drone” in the search box of the Federal Aviation Administration and the first thing you get is a transcription of a webcast that launches into what a drone is (a precision weapons system used by the government to engage the enemy) and what it isn’t – an unmanned autonomous system such as the type used to monitor crops or power lines. The point being, don’t use the d-word. Whether that was legal is now being discussed by august bodies such as the Poynter Institute, but no one in those ranks pays much mind to the use of the words “drone” or “unmanned” themselves. We’ve also heard that a drone is a small buzzing insect that does not do any work (thanks, Dad). George Lucas tells us a drone is a canister-type or humanoid robot that answers to R2D2 or C3PO … oops, what a minute, that would be droid. Skip that one. The point is, while industry and government folks look askance at the dreaded d-word, the word itself is becoming a catch-all for practically anything that flies, except for maybe Frisbees™, although the preferred term there is flying disk. Of course, if you holler “toss me the flying disk” across the Drillfield, don’t expect to get much action. Enough semantics! What does the data tell us? We went to John Jackson, Virginia Tech’s web communications maestro. Since Aug. 1, the words drone, drones, and drone research added up to 37 searches on Virginia Tech’s main site. “Military unmanned aircraft” scored two searches and “unmanned aircraft” landed one. More irksome, try as we may to eliminate alphabet soup in our communications, UAV in its uppercase and lowercase forms scored 12 searches, and “uav program” received two. With derivatives of the d-word accounting for about two-thirds of the related searches on the Tech website, we looked at a cloud of the words the media is using to write the story. Again, drones loom large. It becomes clear that if we want to reach all of these different groups — the public, academics, industry — we have to use the words they are using. Maybe along the way, we can move the terminology forward. From small to large, social carnivores are under complex pressures. Our work on carnivores highlights the important interaction between infectious disease and group living species and Allee Effects. We must seek to engage complexity as it will determine the success of our management approaches for system health. Dr Sanderson and Dr. Jobbins (Post Doctoral Research Associates in Dr. Alexander's Lab) work together with Dr Alexander to try and understand the dynamics of infectious disease at the environmental- human-animal interface. 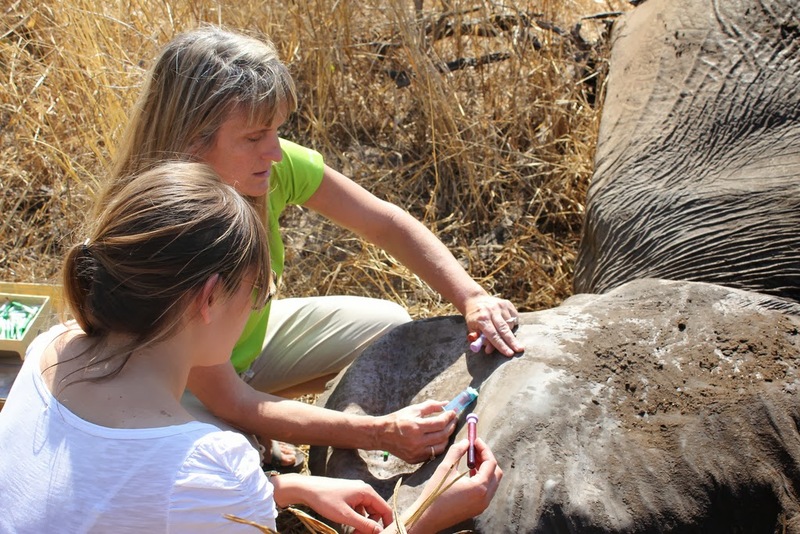 Assessing elephants in the region for infectious disease. Understanding infectious disease dynamics accross a spectrum of animals both domestic and wildlife is central to our program. Information gleaned is integrated with our active research directed at understanding human behavior and its influence on animal behavior. Our recent publication (see above) on carnivores and Allee Effects, highlights the importance of understanding the complexities across human, animal, and environmental systems. It’s spring of 2014, I’m teaching a course that I have not taught since my SCALE-UP epiphany, and thus, this blog will morph yet again. But what could be more appropriate for a morphing blog than a course in Developmental Biology? It’s been a while, but I have taught this class before, and as I’ve already told my students, it is my absolute favorite class to teach. What? More fun than Cell and Molecular Biology? Even better than Cancer Biology? Yes, it’s that good. I’m not entirely certain why but throughout my graduate education and career as a cell, molecular and developmental biologist, the title of developmental biologist was always the most comfortable fit for me. Developmental biology is about change, upon which I thrive, but even more than that, it’s about progress, about moving forward toward ambitious yet achievable milestones – gastrulation, organogenesis, hatching (or birth). In my own research, I studied the development of frogs. I found frogs to be a particularly compelling model organism because, just when this creature seems to have mastered something (e.g. swimming from predators), BAM!, it’s time to switch gears completely, active new developmental programs, and start all over again. Let’s lose that tail and grown some legs! My research program focused on a particular developmental milestone called the midblastula transition, or MBT, in the South African clawed frog, Xenopus laevis. Prior to the MBT, Xenopus embryos undergo rapid cell divisions, such that within five hours of fertilization, one relatively large cell, the egg, has become 4096 microscopic cells. With mitosis occurring every 30 minutes in near synchrony across the embryo, there is little time for the embryo to do anything else. No time for growth, no time for gene expression (the embryo relies entirely upon maternally stored mRNA and proteins), and apparently no time to worry about mistakes. This last characteristic is where I made my contributions to the field of frog development. I was interested in cell cycle checkpoints, those mechanisms present in eukaryotic cells that put the breaks on the cell cycle when something is seriously wrong such as damaged or unreplicated DNA. But early Xenopus embryos didn’t seem to engage these checkpoints. We blasted embryos with gamma rays and X-rays to damage the DNA and the embryonic cells kept dividing in synchrony with their untreated siblings, every 30 minutes. We treated the embryos with a drug called aphidicolin to completely block DNA replication and they kept on dividing. With no DNA…. ….until the MBT, when Xenopus embryos with damaged or unreplicated DNA engaged in what I came to refer to as the mother of all checkpoints. At the stage when embryos should have initiated transcription of their own genomes for the very first time, those with damaged or unreplicated DNA committed apoptosis, or programmed cell death (Sible et al, 1997). And it wasn’t subtle. Dying cells would come spewing out of the blastocoel, the hollow cavity of the embryo, like a tiny little volcanic eruption. I spent hours upon hours peering through the microscope, in morbid fascination of these embryonic suicides. Why in the world would this happen? I lost a lot of sleep over this question. My favorite speculation was that the “apoptotic checkpoint” as we called it, provided distinct advantages for the organism. Frog embryos do not have mouths to eat nor tails to swim away. Floating around in the pond, they are about as vulnerable as a human infant. It is in the best interest of the embryo to develop quickly into a tadpole. The first order of business is cell division, which as I mentioned, happens quickly. Up until the MBT, the embryo is little more than a ball of undifferentiated cells, and it is only after gene expression begins at the MBT that one cell is significantly distinctive from another. Perhaps, rather than wasting time engaging checkpoints at every cell cycle, Xenopus embryos have evolved to divide unchecked until the MBT, the first time when damaged or unreplicated DNA would have a consequence, and at that stage, use the apoptotic checkpoint to clean house, ridding the embryo of any genetically damaged cells. In our experiments, we used insanely high doses of ionizing radiation or chemicals, but in the real world, these damaging events would likely be few and far between, with just a few of those 4096 cells in need of removal. Recent experiments by undergraduates working in my lab have supported this hypothesis. They were able to ablate a certain percentage of cells before the MBT and the embryo would develop into a more or less normal tadpole (Mulholland et al, unpublished). This story might have had a scientifically satisfying ending if it weren’t for the spring peepers. I love listening to them through my bedroom window at night, which got me interested in local species of frogs such as those studied by my friend and colleague Dr. Lisa Belden. Virginia is home to not only spring peepers, but also wood frogs, bull frogs, American toads, green frogs, gray tree frogs, and more. Under Lisa’s tutelage, I began mucking through puddles and swamps. My neighbors would catch me sneaking into their cultivated fish ponds at night, flashlight in hand, looking for frog eggs. I became obsessed with collecting embryos from as may amphibian species as possible. My children do not have fond memories of this period. I dropped one of them, then a toddler, into an ice-crusted pond in February while reaching for wood frog eggs. She marks that as the day that she decided to become a lawyer, not a scientist. My goal was simple – establish the apoptotic checkpoint in as many species as possible, then publish the findings in a good journal. Once I established some credibility with the ecology crowd, I could pursue the ‘why’ questions about the apoptotic checkpoint though field studies. The experiments were straightforward. We collected pre-MBT embryos from native species, blasted them with X-rays, then waited for them to die at the MBT. We waited, and waited, and…..waited. Nothing happened. The embryos did not undergo apoptosis, but they did not move past the MBT into gastrulation either. They just sat there with arrested development. We waited for hours and hours. We waited days. We waited weeks. Nothing happened. Eventually the embryos died, but not in any developmentally meaningful way. The dishes in which we kept them would become contaminated and moldy. Or someone would forget to add more medium and they would dry up. So much for easy answers, or publications for that matter. I didn’t know what to make of these data, and honestly I still don’t. Xenopus laevis is one of a handful of established model organisms for studying vertebrate development. We extrapolate our findings to fish and mice and people. But these data suggested that the discovery of the apoptotic checkpoint, although it had later been demonstrated in zebrafish (Ikegami et al, 1999), did not apply to all frogs, certainly not to Virginia frogs. Even more puzzling, our data suggested that embryonic development could be arrested, for a long time, maybe even perpetually. This was not what I signed up for when I became a developmental biologist. I wanted embryos with ambition, with a future, that knew where they were going and got there fast. That’s how I rolled. So I took to the water, and am learning to swim despite the nagging of my inner frog, “wrong direction, lady”. It’s the one time I can move without asking anything of His Excellency Pubis Ramus. Perhaps becoming a swimmer is my MBT, or my likely my MLC (mid-life crisis). At any rate, it feels good to be moving again. Understanding how complex phenotypes arise from individual molecules and their interactions is a primary challenge in biology that computational approaches are poised to tackle. We report a whole-cell computational model of the life cycle of the human pathogen Mycoplasma genitalium that includes all of its molecular components and their interactions. An integrative approach to modeling that combines diverse mathematics enabled the simultaneous inclusion of fundamentally different cellular processes and experimental measurements. Our whole-cell model accounts for all annotated gene functions and was validated against a broad range of data. The model provides insights into many previously unobserved cellular behaviors, including in vivo rates of protein-DNA association and an inverse relationship between the durations of DNA replication initiation and replication. In addition, experimental analysis directed by model predictions identified previously undetected kinetic parameters and biological functions. We conclude that comprehensive whole-cell models can be used to facilitate biological discovery.